Check-in starts at 8:00 am. Singles will follow the conclusion of doubles. All Iowans are eligible to participate! Matches will be best 2 out of 3. games will be played to 11, win by 2. If the 3rd game is needed, sides will switch when either side first reaches 6 points in that 3rd game. Age groups may be combined in the event of limited numbers/participants. 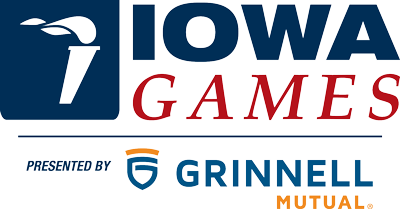 Iowa Games reserves the right to modify format based on number of participants. A player may enter one singles, one doubles and one mixed doubles for the entry fee. During registrations players will be asked to rate themselves. If registering via mail please include your rating on your entry form. Each member of a doubles team must complete a separate entry form and pay the entry fee. If playing doubles, all players must indicate who their partner is on the entry form. Individuals wishing to be assigned a doubles partner should indicate ‘Need Partner’ on entry form. The tournament director will attempt to assign a partner. Pickleballs will be provided. Players must provide their own paddle. Athletes will receive a colored T-shirt. Pre-registered athletes have the option to upgrade to a dri-fit shirt for an additional $10 through June 24. T-Shirts will be at your venue. *You are welcome to register for any age-based bracket you qualify for. Age-based brackets have a beginning age only and a participant (or the younger of two in a doubles pair/team) may be no younger than the starting age (for respective brackets).